I began hiking frequently in 2006 and have since hiked in Western Canada, Australia, and spent 2 months backpacking in the Alps. I spend most weekends either day-hiking or on 2-3 day backpacking trips, with some longer trips when I can manage them. I also snowshoe and ski in the winter, but don’t have a lot of experience with winter in the backcountry yet. Elevation is typically 500-3,000 m (1,600-10,000 ft), in the Canadian Rockies and the Selkirk, Purcell, and Monashee ranges. 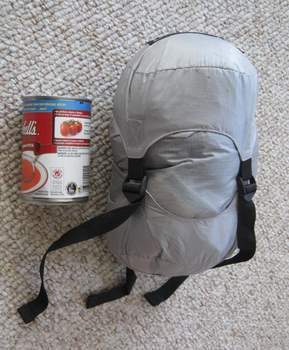 I try for a light pack, but I don’t consider myself a lightweight backpacker. The REI Lightweight Compression Sack is a basic compression sack made from silconized ripstop nylon. The opening of the bag cinches with a draw-cord, a cap covers the top and bottom, and four nylon straps allow me to compress the bag and its contents in one direction. One of the end caps has a sewn-on label, and on the other end is a haul loop. The straps and haul loop are sewn on with a box stitch. I purchased my two REI Lightweight Compression Stuff Sacks in 2010 while on a trip in the USA, and put them to the test immediately. On my trip home they got used to pack my dirty rock climbing and hiking clothes, and got covered in hairspray on my flight (aerosol can + pressure change = leak). Since then, one of the sacks has lived in my search and rescue pack, containing all of my spare clothes that I carry in case I get stuck out overnight. It’s been packed constantly for the past two years. The other one has been used for backpacking trips, probably spending a total of about 5 days packed. The Lightweight Compression Stuff Sacks have done well compressing the gear that I shove in. On any day in my search & rescue pack, one contains a spare pair of wool socks, spare long underwear, and a down jacket, and occasionally has more stuff added in the winter. With the size that I have, compressing the basic set of extra clothes means that I have the straps pulled as short as they go. The 6 L (366 cu in) size is, unfortunately, not quite big enough to get my tent and fly in, though I have tried. Although not waterproof, the compression sacks have done a good job keeping my gear dry from moisture. I have had water soak through my pack and onto the sacks a couple of times, and the contents have stayed dry. That includes protection from hairspray! The thin, slippery fabric is good for sliding things in and out of the compression sack, and for sliding the sack in and out of my backpack, but it can be hard to grip and stuff clothes into the sack. A minor inconvenience, really, and I think the benefits outweigh the downsides. I have had many occasions where one or more of the nylon straps twisted as I was trying to pull them tight, which means I pull a twist into the buckle. I’ve never had any trouble reversing the process and pulling the strap back out, though. The straps are easy to grab and pull, and also to release. I have no complaints about the durability of my compression sacks. The one that’s been used less looks brand new, and the one that stays packed all the time is not far behind. There aren’t any tears or broken stitches. I’m amazed at how well they endured being coated with hairspray, but I haven’t noticed any degradation of the material. The REI Lightweight Compression Stuff Sack is, well, a lightweight compression sack. It’s basic and does its job well.